Recipes! 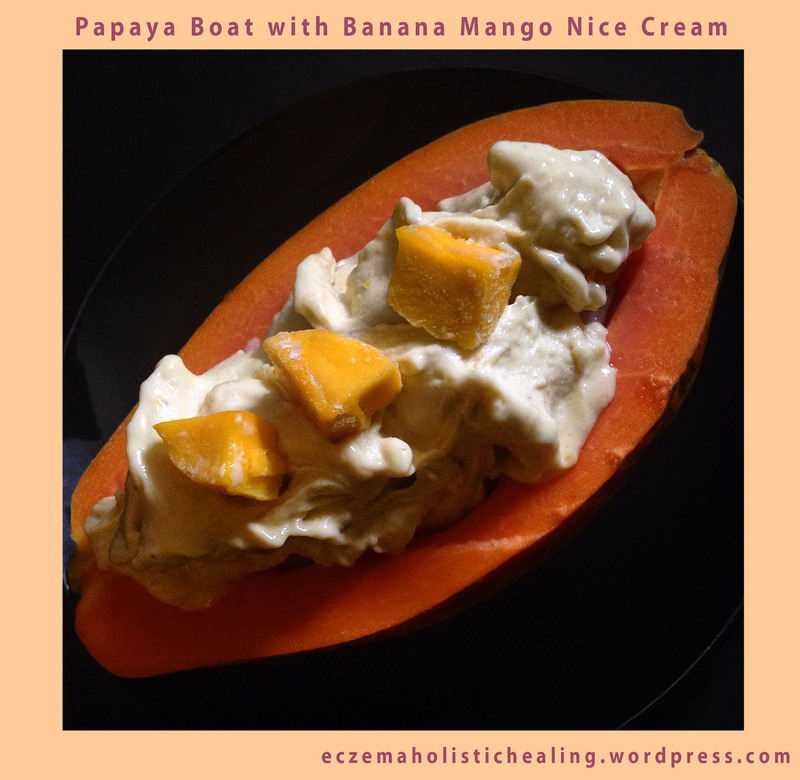 – Papaya Boat with Banana Mango Nice Cream! *tip! Save the seeds from the papaya, wash and freeze. You can use these as a natural anti-germ remedy for parasites, infections and as a natural antibiotic. Just take a spoonful on an empty stomach, crush (I like to just crush with my teeth…holding my nose of course) and swallow with water. I’ve used this remedy many times while going through an intense flare with oozing skin. It helps to keep any infection away, and in my opinion it speeds up healing. It seemed to draw out the ooze and heal it up quicker! All of those wonderful enzymes go to work to heal the body! Gotta love natural, drug free remedies! Papaya Boat with Banana Mango Nice Cream! add a knob of grated ginger for a nice kick! Take frozen banana, mango and optional grated ginger and place in a high speed blender. While using the tamper (tool used to push down contents in blender while blending) blend the frozen fruit until it’s a creamy ice cream consistency. You can add a tiny bit of water if you want it like a soft serve consistency, but I like it without liquid. Scoop into the papaya boat and enjoy!